Members of the public visiting one of the police booths. 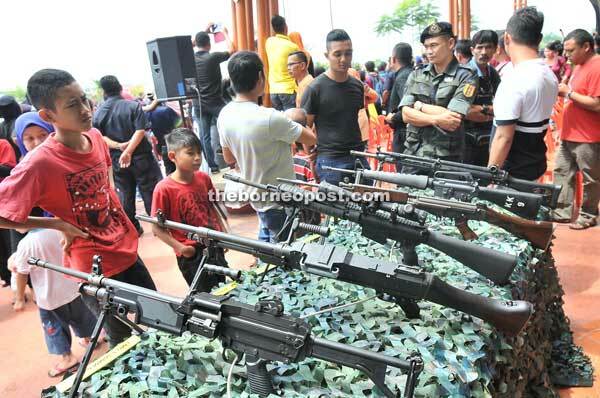 KOTA SAMARAHAN: The Sarawak Contingent Police ‘Crime Awareness Day’ received an overwhelming response with large crowds that thronged its booths held at the Summer Mall yesterday. With more than 10 booths being set up, the event was aimed to raise awareness to eradicate crime in the state, as well as seeking cooperation from the public to rid of criminal activities. Through the event, it was hoped that police would get a commitment from the public to assist in crime prevention. “The booths we set up today (yesterday) is to give exposure and various information to the public on criminal activities as well as road safety measures. 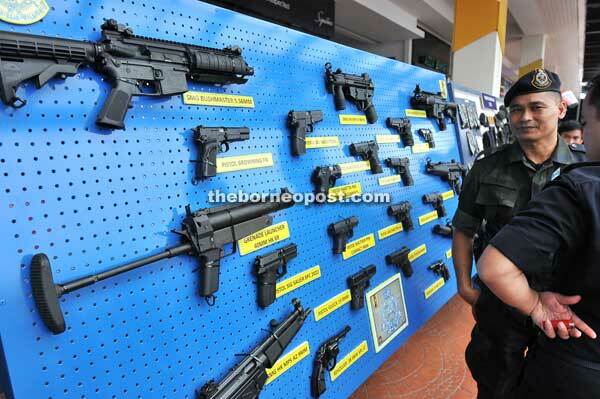 “It is also a chance for the public to speak to the police on whatever doubts they have,” said Sarawak Police Commissioner Dato Sri Wira Muhammad Sabtu Osman when officiating at the event. He added more efforts were needed to increase awareness on crime prevention among the citizenry. Citing an example, motorcycle thefts could be avoided if owners locked them even if left unattended for a short time. But the habit of locking their vehicles was still low with some careless owners leaving behind the keys still attached to their motorcycles, he said. He stressed that the responsibility to prevent and combat criminal activities did not merely rest on police and that members of the public had a role to play. “Today’s programme is one of our efforts in crime prevention. We are grateful that through our (combined) efforts, the crime rate has been reduced overall. “Despite this, combating crime is still our important agenda,” he said. He also urged parents not to allow their teenage children to use motorcycles without valid licence as this would encourage them to break the law from a young age. Sabtu said if they could break the law at an early age, they may commit heavier crimes in future. He later expressed his appreciation to Summer Mall’s managing director Dato’ Lee Chee Fui for providing the venue for the police event. Among those present were deputy Sarawak Contingent Police Commissioner Dato’ Dr Chai Khin Chung, Sarawak Brigade Commander SAC Dato’ Isa Munir, Sarawak Contingent management department head SAC Dato’ Mohd Jasmani Yusoff, Crime Prevention Department (community safety), Sarawak Contingent head SAC Burhanuddin Abdul Majid, and Commercial (CID) crime investigation department head superintendent Yow Kok Khiang.